K, now down to business. 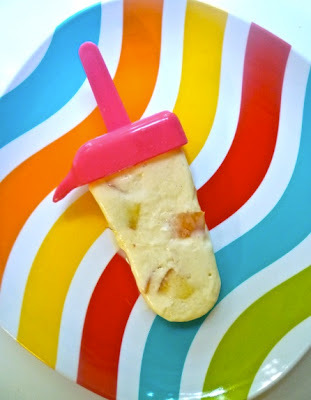 I saw these honey yogurt pops on Pinterest a few weeks ago and knew that at some point I wanted to give them a try. I didn't end up planning when I'd make them; it just happened somewhat serendipitously. I realized one day that I had all the ingredients to make them, along with a few minutes of "free" time, so I got to work on 'em! They really took no time at all (the freezing part is the longest portion of this recipe!). The recipe is adapted from Joylicious. The original recipe is for honey yogurt berry pops, and it calls for a mixture of different berries. 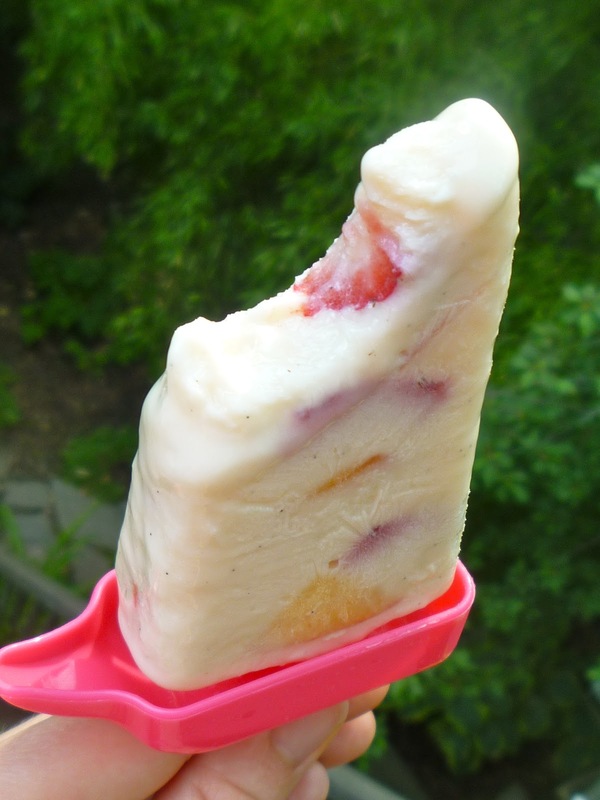 I had peaches and strawberries on hand, so that's what I used! Deeelicious and so refreshing!! Mix together the yogurt and honey in a large bowl. Fold in your choice of fruit. Transfer this mixture into a container with a spout so you can pour it into your molds (or, you can use a spoon to spoon it into the molds). 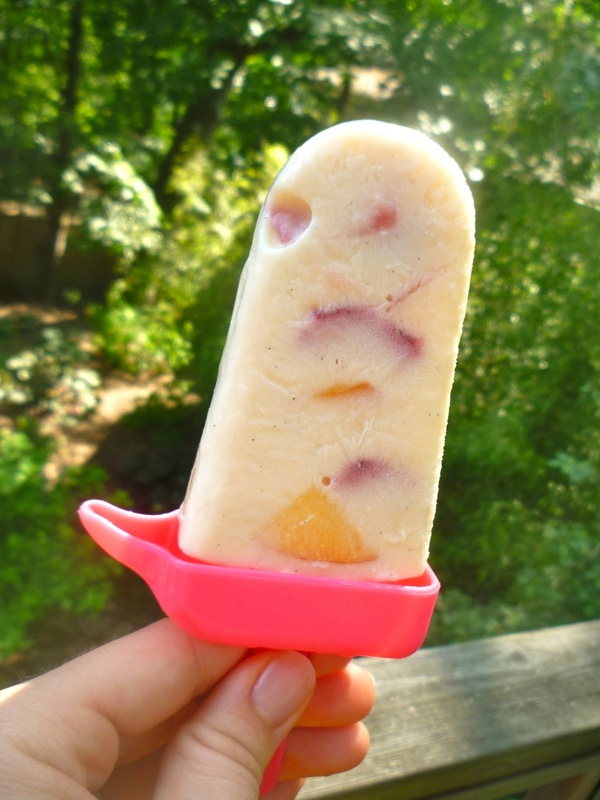 Fill your popsicle molds almost to the top, and freeze 3 hours or overnight. Remove pops according to package directions before eating (often, this involves running the molds under warm water for a couple minutes). 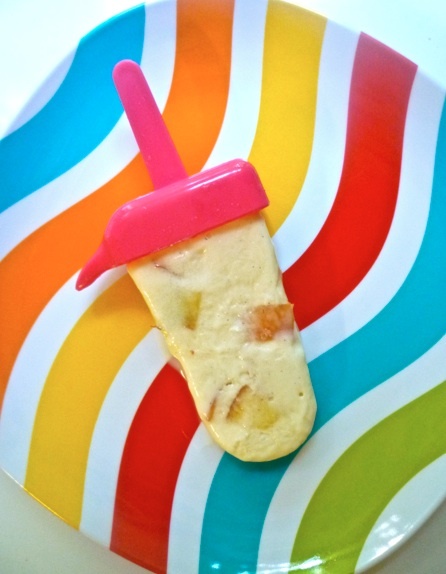 This recipe made 8 popsicles for me. Perfect for those warm summer days we've been having! What are some of your favorite popsicle flavors, homemade or store bought?? !